The influenza virus life cycle begins when a virus infects a cell and then tricks the cell into producing new virus particles. 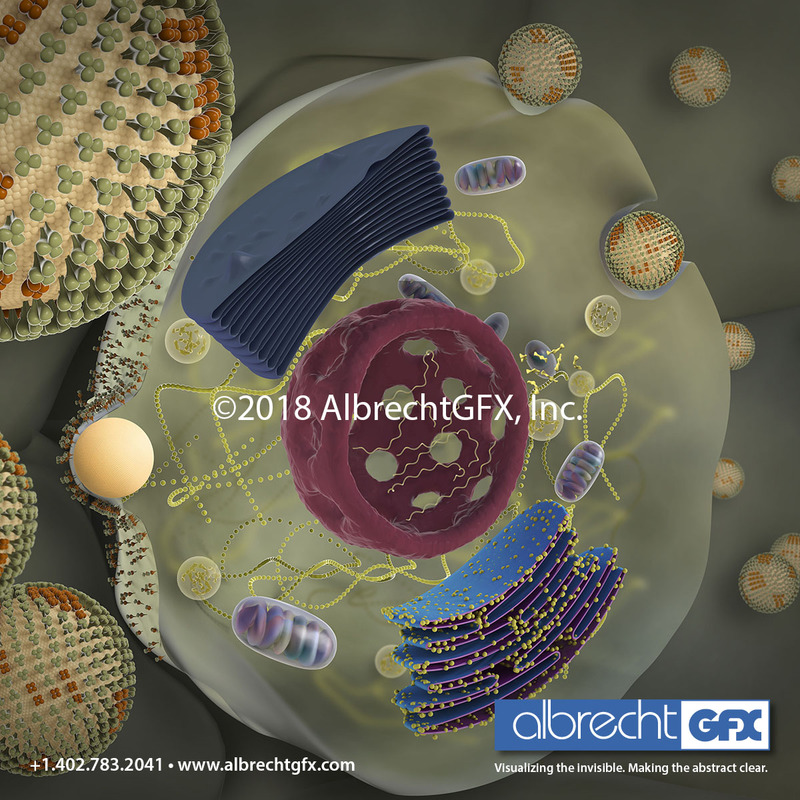 Most of our work is on the cellular level, but we’ve noticed an increased interest in illustrations on a molecular level. Changing magnification level changes the elements in a graphic. Cellular level visual: includes cells on gut wall covered by finger-like projections (villi) and microvilli on cells’ villi surface. Molecular level visual: close up of Brush Borders on Microvilli that cover one cell’s surface. Villi not shown. Our first 3D sample of the gut biome –molecular level, depicting one cell in an out-of-balance gut microbiome due to food poisoning. 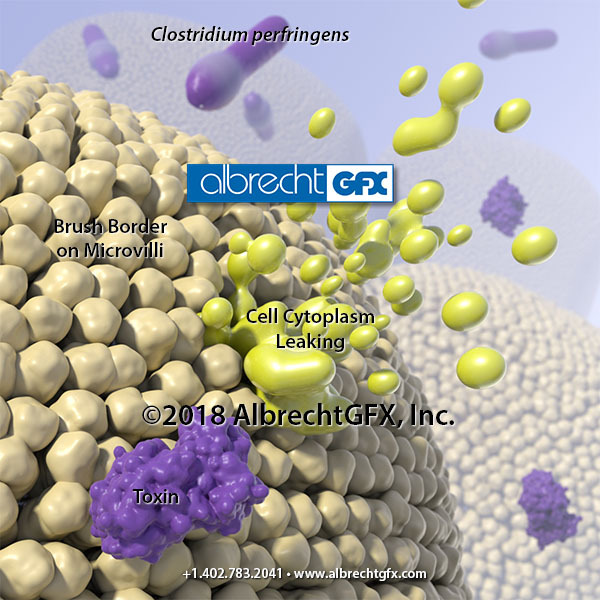 Unchecked, bacterium Clostridium perfingens damages microvilli the cell’s walls and causes contents to leak. One approach to stimulation of an immune response using a DNA vaccine. For years, I was lax at keeping my cell phone charged and available when attending social gatherings. That doesn’t happen any more. 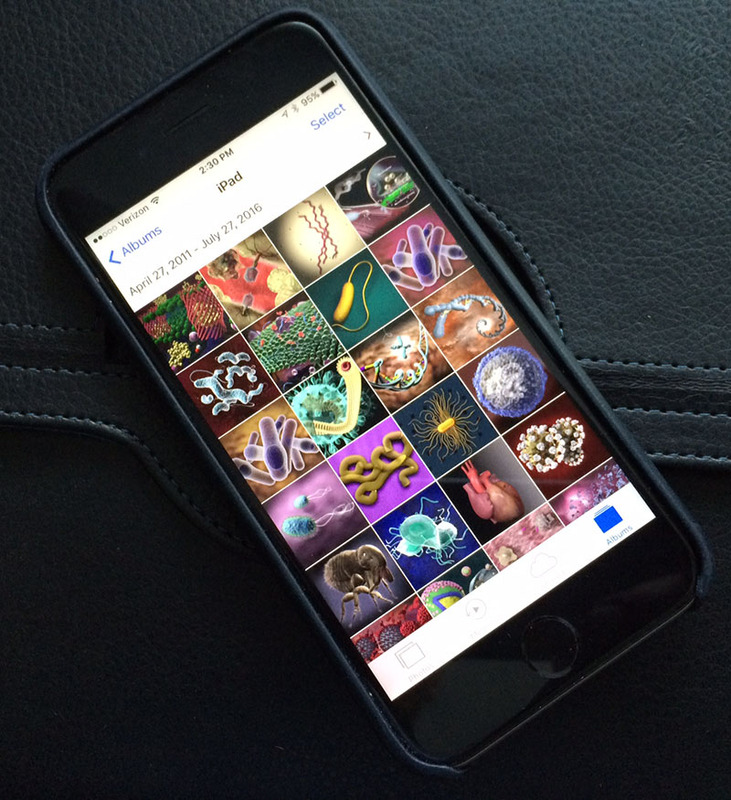 Now I have an iPhone gallery of illustrations so anyone can see what we do when they ask about our company. That principal works for everyone. Visuals (3D illustrations & animations) bridge language barriers and levels of technical experience in a way that words alone cannot. Visuals make messages memorable and easier to understand. If you haven’t done so, check our online gallery. The gallery is a compilation of sample illustrations that cover a variety of biological topics and show technical expertise. Email or give us a call if you’d like to discuss your project. This illustration is one of three illustrations depicting differences between balance / imbalance in gut “bugs.” It shows a bacterial infection in colon tissue caused by a microbiome imbalance. The imbalance reduces the clear slimy layer (butyrate) covering villi. Without a solid butyrate layer, bacteria invade the exposed tissue between villi. The body’s immune system responds and sends red blood cells, T-cells, and macrophages to the area to fight the pathogens. 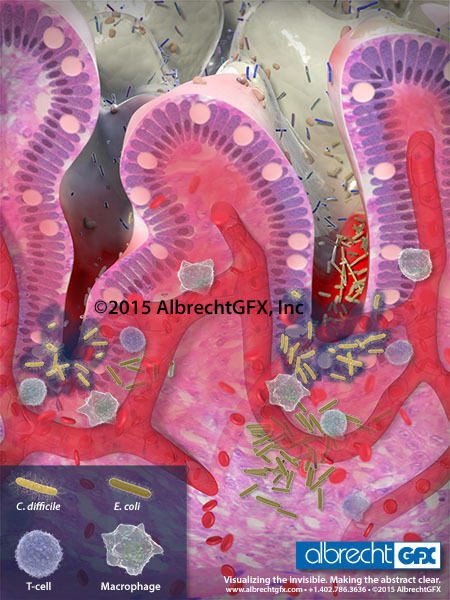 The legend inset shows C. difficile and E. coli bacteria along with T-cell and macrophage that respond to infection. At some point, the illustration may be a starting point for an animation. Owning a business is not easy, but it has a few incredible benefits. One of those perks is the opportunity to focus our 3D illustration / animation company capabilities on subject matter of personal interest and curiosity. For us, that subject is biological science. Our online gallery includes visuals related to both plants and animals. The gallery has a few graphics related to plants, but the majority are micro, macro, cellular depictions of animal species, e.g. cattle, horses, pigs, cats, dogs, humans. 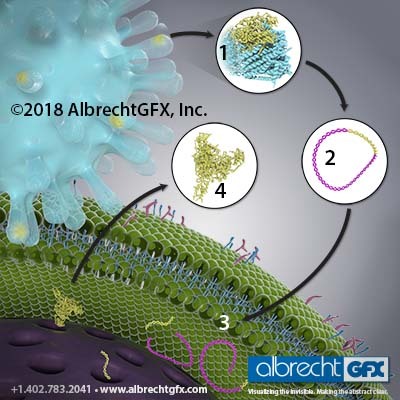 We use 3D illustration and animation tools to make biological content available and understandable to a worldwide audience– crossing language barriers and levels of technical knowledge. Pictured here is a molecular sequence that occurs every day in dairy milking parlors­–milk let-down. The chain of events involved in milk let-down is difficult to show because the sequence involves both the nervous system and circulatory system throughout the body. We’ve used numbers, callouts of specific body regions, and colored arrows to trace the pathway through the body. As good as this illustration is, we think animation makes this idea easier to understand. As I write this, Don is working on the animation. We’ll post a link to the animation when it is available. 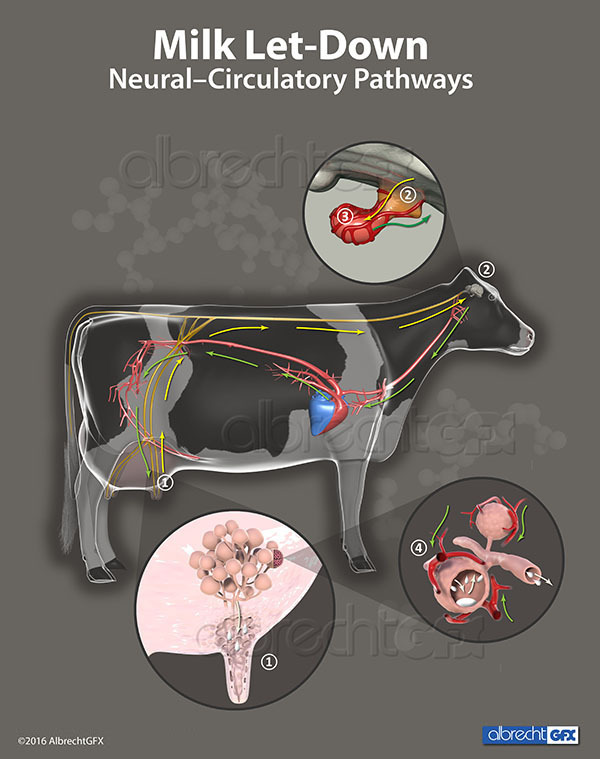 (1)Teat suckling (by calf or milking machine) sends nerve impulses to the brain’s hypothalamus(2) and on to the pituitary(3). The pituitary gland secrets oxytocin into the blood stream, which carries it to udder alveoli(4). Udder alveoli contract to let down milk. 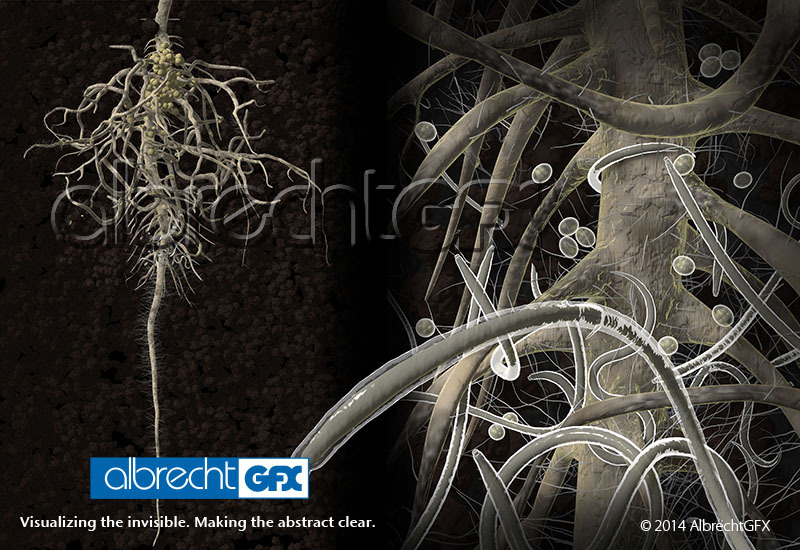 The illustration above shows nematodes in the soil ready to feast on soybean roots. It’s a bold image and a favorite of mine that we often use in our trade show exhibit. With a trade show coming up, we’re reviewing all of our display graphics. 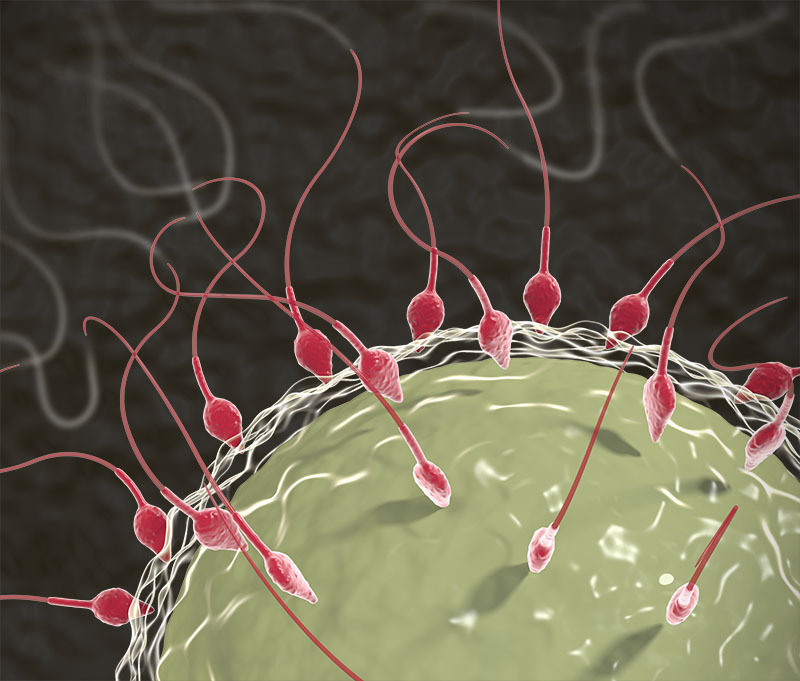 Our illustrations cover macro, micro, and cellular level depictions of topics such as: respiratory issues, nutrition, immunity, and genetics. We look for eye-catching, vibrant visuals that have broad content appeal and connect with our audience: researchers, sales/marketing and training professionals, and advertising agencies. We are successful when trade show attendees see visually appealing graphics that pique an interest in the subject matter and what we do: convert technical content into visuals that appeal to both technical and non-technical audiences. 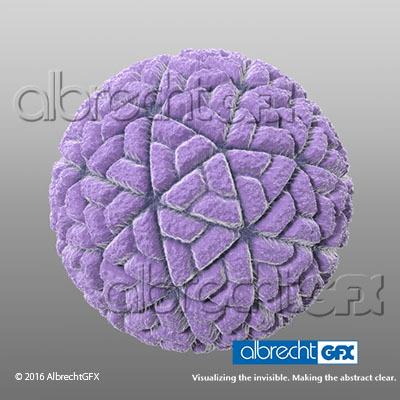 This 3D illustration depicts the Zika Virus that is causing public health emergencies in South America and elsewhere. Today I’m trying something new-posting the illustration on LinkedIn. Let me know what you think. Who owns the completed project? The client. Our work is considered “for hire,” that is, we relinquish all rights to the finished illustration / animation. Clients are free to use the illustration / animation as they choose and as often as they want. Forever. How long will it take to finish an illustration? How much will it cost? These two questions are the ones most people want answered. They’re the questions I’d want answered too. The problem is, no project is exactly like another. 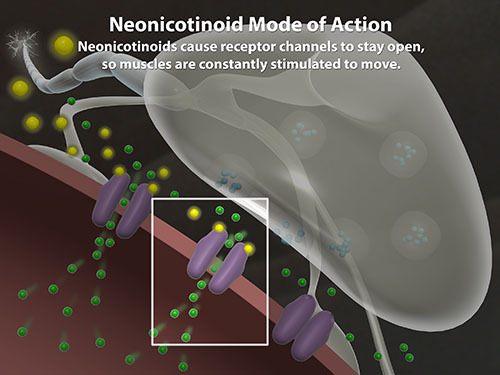 Each illustration and animation is unique, as are the variables surrounding the project. For that reason, we are most comfortable providing a cost/time estimate range based on expected time and materials used to complete a project. If questions, please contact me @+1.402.786.3636. What about the scientific / technical accuracy of an illustration? Your subject matter expert (SME) is the ultimate authority. We research every project in order to ask questions, discuss content with your SME before beginning illustration. That way, your SME will quickly sign-off on the final illustration.